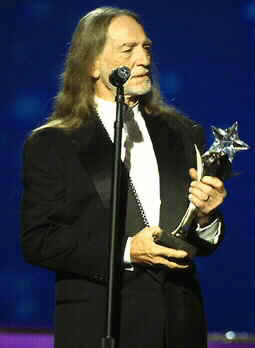 My hero has always been Willie! Without an introduction he sauntered out to center stage wearing his trademark red bandanna, tee-shirt and well-worn jeans. Looking more like a stage-hand than a superstar, before a sold out audience at the Orleans Casino in the "Entertainment Capital of the World", Willie Nelson took his rightful place in the spotlight as the living definition of the word entertainment. As one of the most readily identifiable artists in the world, he needs no introduction. His casual stroll onstage caused a spontaneous outburst of thunderous applause that was deafening and continued to resonate throughout the theater well into the middle of the first song. Except for the delightful grin and a few nods towards the audience, he seemed almost unaware of the applause as he picked up his guitar and started playing. One by one the members of his band joined him onstage giving the appearance of an impromptu jam session as opposed to an organized concert. Crazy, Blue Eyes Cryin' in the Rain, Stardust, Georgia on My Mind, Mammas Don't Let Your Babies Grow Up to Be Cowboys, My Heroes Have Always Been Cowboys, On the Road Again, Always on My Mind, Me and Paul, Angel Flying Too Close To The Ground, Night Life, Please Don't Talk About Me When I'm Gone, All Of Me and many, many more; for the next two hours and ten minutes he did not stop. The end of one song became the beginning of the next. What made this medley of readily identifiable hits so unique is that nearly every single song was written, or co-written by Willie Nelson himself. He was inducted into the Country Music Hall of Fame in 1993 - twenty years AFTER his induction into the Nashville Songwriters Hall of Fame. It is William Hugh Nelson the songwriter that created Willie Nelson the troubadour and consummate singer. 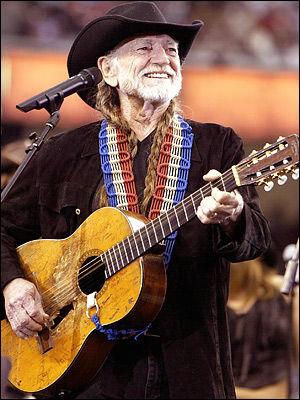 Country music is a world dominated by words and the strength of Willie Nelson's songs are in his lyrics. But it is the man, who has remained true to himself, that sets him apart and makes him a beloved entertainer. His voice is as worn as the jeans he wears and as unique as the, now famous, pigtails. The voice is also as unique as the man. We have come to trust the integrity of his lyrics and readily identify with many of them. He delivers the music from a place in his soul that gives it wings and sends it straight to the heart of those who hear it. During this two hour concert he managed to invoke every human emotion from his audience. There were collective sighs, giggles, outbursts of hearty laughter and then some songs where it got so quiet, and the voice was so hypnotic, that you forgot you were sitting with 2,000 other people and he seemed to be singing only to you. In 1996 TNN/MCN finally realized what I, and millions of others around the world, have always known... Willie Nelson was presented the Living Legend Award. No one else has a voice like his. His incredible talent for writing music and playing the guitar is just as unique. When God made Willie, unfortunately, He really did throw away the mold. There is only one Willie Nelson. Singer-songwriter and guitarist, William Hugh Nelson, was born in Abbott, Texas on March 30, 1933. He was educated at Baylor University. He composed a number of hits for other artists, including Crazy (1961) for Patsy Cline and Hello Walls (1961) for Faron Young. In 1962 he began performing his own material in Nashville and in 1964 he joined Nashville's Grand Ole Opry. His awards include the Country Music Association's Entertainer of the Year (1979) and Grammy Awards for the songs Blue Eyes Cryin' in the Rain (1975), Georgia on My Mind (1978), Mammas Don't Let Your Babies Grow Up to Be Cowboys (1978; written with Waylon Jennings), and On the Road Again (1978). In 1978 he surprised and pleased everyone with the release of his mellow Stardust album of standards. Then in 1982, he had his biggest pop hit with Always on My Mind. In 1994 came another pleasant surprise with the release of one of my favorite albums, Healing Hands of Time which gives new meaning to the "easy" in "easy listening".